A portion of the night’s proceeds will go to fund the Tails of Courage dog shelter in Danbury, CT.
Photo above: Hi my Name is Jack. I came to Tails of courage in January with my mom, brother and sister. Everyone has been adopted already but for some reason I keep getting overlooked. Let me tell you a little bit about myself: I am about 2 years old, I came from a shelter in West Virgina where I was born. I am a very shy boy but if you give me a little time I love to cuddle with you. I like that I get to play with the other dogs at TOC. I even like my cuddle time with the TOC cat. I am a very gentle soul. I just need someone to take the time to help me build my confidence. I am up to date on my shots, neutered, and microchipped. As much as I love everyone here at TOC I would really like to have a family to call my own. Please come meet me…you won’t regret it! HELP A LOCAL ANIMAL SHELTER! 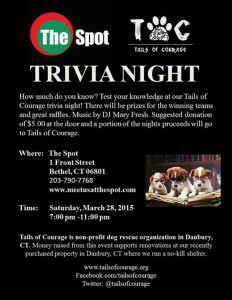 Announcing a fundraiser for Tails of Courage, a dog rescue and shelter located at 39 Smith Street in Danbury, CT. 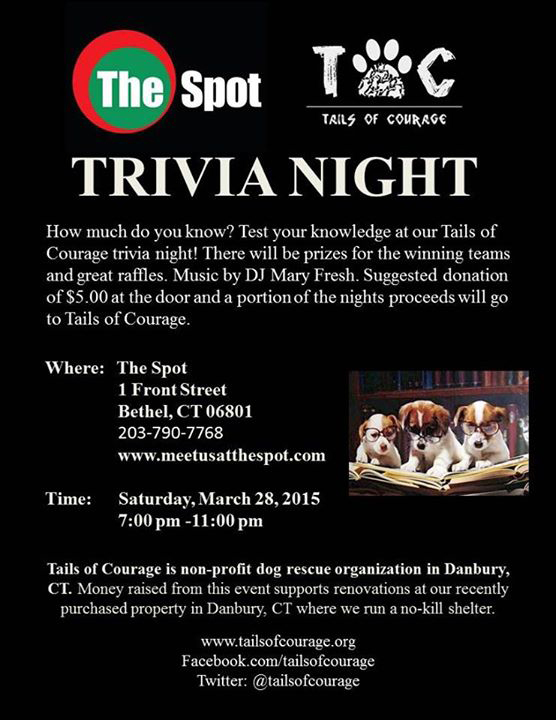 The Spot, at 1 Front Street in Bethel, CT, is holding a trivia night on Saturday, March 28, 2015, 7:00 p.m. to 11:00 p.m..
How much do you know? Test your knowledge at Tails of Trivia night at The Spot. There will be prizes for the winning teams and great raffles. Music by DJ Mary Fresh. Suggested donation of $5.00 at the door and a portion of the night’s proceeds will go to Tails of Courage. Money raised from this event supports renovations at the recently purchased property in Danbury, CT, where Tails of Courage runs a no-kill animal shelter. Tails of Courage is a Christian based national non-profit organization committed to helping our communities. Founded in 2009, by a survivor of the World Trade Center attacks in New York City on September 11th, 2001, in an effort to honor the heroes lost in the tragedy, the mission of the organization is to help as much as possible with various programs within the communities we serve. We welcome everyone, from all walks of life, all beliefs, all backgrounds, and want to have a positive impact on the world around us. We are entirely funded by donations and depend on volunteers. At present, Tails of Courage has Chapters in Connecticut, New York, Pennsylvania and West Virginia with California and Massachusetts coming soon! We allow and even encourage children under the age of 18 to volunteer with the shelter dogs. All children, regardless of age, may volunteer with Tails of Courage. Children under 13 must have an adult accompany them. We have partnered with local schools for children to obtain their community service, and most importantly to learn about the care of animals. Families volunteer together. 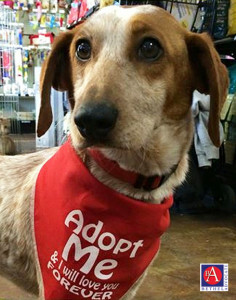 Our CT Chapter is home to our no-kill CAGE FREE animal shelter! I just want to mention I’m all new to blogging and site-building and truly enjoyed your web page. Probably I’m going to bookmark your website . You surely have perfect writings. Cheers for revealing your website. fantastic activity in this subject! Attractive section of content. I just stumbled upon your weblog and in accession capital to claim that I get actually enjoyed account your weblog posts. posts. Anyway I will be subscribing on your feeds or even I success you get entry to persistently quickly. Greetings, I do think your website might be having web browser compatibility issues. Every weekend i used to go to see this web site, because i want enjoyment, since this this website conations really good funny material too. I am glad to seek out numerous useful information right here within the submit, we’d like develop more strategies in this regard, thanks for sharing. You made several nice points there. I did a search on the matter and found most folks will have the same opinion with your blog. It¡¦s actually a great and useful piece of information. I¡¦m glad that you just shared this useful info with us. Please stay us informed like this. Thank you for sharing. Great remarkable issues here. I¡¦m very satisfied to see your article. Thanks so much and i am having a look ahead to touch you. Will you kindly drop me a mail? It¡¦s actually a nice and useful piece of info. I am satisfied that you just shared this helpful info with us. Please keep us informed like this. Thanks for sharing. Hi my loved one! I want to say that this post is awesome, great written and include approximately all significant infos. I would like to peer more posts like this . Whats Going down i am new to this, I stumbled upon this I’ve discovered It positively helpful and it has aided me out loads. I hope to contribute & assist different customers like its aided me. Good job. fastidious and the viewers are in fact sharing good thoughts. Thanks for any other informative site. The place else may I get that type of info written in such a perfect way? I have a mission that I am simply now working on, and I’ve been at the look out for such information. magnificent post, very informative. I’m wondering why the opposite experts of this sector don’t understand this. You should proceed your writing. I’m sure, you’ve a great readers’ base already! Needed to draft you this tiny word to be able to thank you once again considering the wonderful thoughts you’ve featured at this time. This is simply unbelievably generous of you to grant unhampered what exactly many individuals could possibly have distributed for an electronic book in order to make some dough for themselves, precisely given that you might have done it if you ever wanted. Those advice in addition acted like a great way to recognize that other people have the identical eagerness just as mine to grasp a little more in terms of this issue. I think there are many more fun situations in the future for individuals who discover your blog. I really wanted to make a quick remark so as to express gratitude to you for the unique points you are writing at this site. My long internet research has now been paid with awesome suggestions to write about with my co-workers. I ‘d state that that most of us site visitors are unequivocally lucky to exist in a really good site with very many awesome professionals with valuable guidelines. I feel rather privileged to have encountered the web site and look forward to plenty of more awesome minutes reading here. Thanks once more for a lot of things. I’m also commenting to let you be aware of of the excellent discovery my wife’s girl went through browsing yuor web blog. She came to find many issues, not to mention what it is like to possess an incredible giving heart to get many others effortlessly have an understanding of selected specialized issues. You actually exceeded our desires. I appreciate you for supplying these informative, dependable, informative as well as cool guidance on that topic to Janet. I wish to express my respect for your kind-heartedness for those individuals that really need help with in this area of interest. Your special commitment to passing the message all through was certainly informative and have constantly encouraged those just like me to achieve their goals. Your entire interesting suggestions means so much a person like me and much more to my peers. Thanks a ton; from each one of us. good topic. I needs to spend some time finding out more or understanding more. Thank you a lot for sharing this with all folks you really recognise what you are talking approximately! Bookmarked. Kindly additionally seek advice from my site =). We may have a link change agreement between us! Fantastic web site. Lots of useful information here. I¡¦m sending it to several friends ans also sharing in delicious. And obviously, thank you to your effort! You really make it seem really easy together with your presentation however I find this topic to be actually something that I believe I might by no means understand. It kind of feels too complicated and extremely broad for me. I’m looking forward in your subsequent put up, I¡¦ll attempt to get the grasp of it! It¡¦s in point of fact a nice and useful piece of info. I am satisfied that you shared this useful information with us. Please keep us up to date like this. Thank you for sharing. I have been reading out many of your articles and i must say pretty good stuff. I will make sure to bookmark your blog. You actually make it seem really easy with your presentation however I find this matter to be actually something that I think I’d never understand. It sort of feels too complex and very vast for me. I’m having a look ahead in your next publish, I will attempt to get the cling of it! whoah this weblog is excellent i like studying your articles. Stay up the great work! You understand, many persons are hunting round for this info, you could help them greatly. I am no longer certain the place you’re getting your info, however great topic. I must spend some time studying more or figuring out more. Thanks for great info I used to be looking for this info for my mission. Magnificent goods from you, man. I’ve understand your stuff previous to and you’re just extremely magnificent. I really like what you’ve acquired here, certainly like what you are saying and the way in which you say it. You make it enjoyable and you still care for to keep it wise. I can not wait to read far more from you. This is actually a great site. Nice post. I was checking constantly this blog and I’m impressed! Very useful information specifically the last part 🙂 I care for such info a lot. I was seeking this certain info for a very long time. Thank you and best of luck. You really make it seem so easy along with your presentation but I in finding this matter to be actually something that I think I might never understand. It sort of feels too complex and very vast for me. I’m taking a look ahead in your subsequent publish, I will try to get the grasp of it! Fantastic site. Lots of useful info here. I am sending it to a few friends ans also sharing in delicious. And certainly, thanks for your effort! fantastic publish, very informative. I wonder why the opposite experts of this sector don’t understand this. You must continue your writing. I’m sure, you’ve a great readers’ base already! I¡¦ll right away seize your rss feed as I can’t to find your e-mail subscription hyperlink or e-newsletter service. Do you’ve any? Please allow me understand so that I may subscribe. Thanks. I have been examinating out many of your stories and i must say pretty nice stuff. I will definitely bookmark your blog. Thank you a lot for sharing this with all people you actually recognize what you’re speaking approximately! Bookmarked. Please also visit my web site =). We could have a hyperlink alternate agreement among us! I¡¦m now not sure the place you are getting your information, however great topic. I needs to spend a while studying much more or understanding more. Thanks for fantastic information I used to be looking for this info for my mission. A lot of thanks for all your valuable hard work on this web site. My niece delights in making time for investigation and it’s really easy to understand why. Most of us know all about the dynamic means you provide vital thoughts on the blog and therefore foster participation from others on this situation and our simple princess is actually learning a lot. Take advantage of the remaining portion of the new year. You are performing a wonderful job. Fantastic goods from you, man. I’ve understand your stuff previous to and you’re just too great. I actually like what you have acquired here, certainly like what you’re stating and the way in which you say it. You make it entertaining and you still take care of to keep it smart. I cant wait to read much more from you. This is really a tremendous website. I’m still learning from you, but I’m trying to reach my goals. I absolutely love reading everything that is posted on your site.Keep the aarticles coming. I liked it! Good blog! I really love how it is easy on my eyes and the data are well written. I am wondering how I could be notified whenever a new post has been made. I have subscribed to your RSS which must do the trick! Have a nice day! Hi, Neat post. There’s a problem along with your web site in internet explorer, would check this? I am not positive the place you’re getting your information, but good topic. I must spend a while finding out much more or understanding more. Thank you for excellent information I was in search of this info for my mission. What i do not realize is in truth how you’re no longer actually a lot more well-preferred than you might be right now. You’re very intelligent. You realize thus significantly in the case of this subject, made me for my part believe it from numerous numerous angles. Its like women and men don’t seem to be interested unless it¡¦s one thing to do with Girl gaga! Your own stuffs outstanding. At all times care for it up! It is perfect time to make some plans for the future and it is time to be happy. I’ve read this post and if I could I desire to suggest you some interesting things or advice. Maybe you could write next articles referring to this article. I wish to read even more things about it! you’re truly a excellent webmaster. The website loading pace is incredible. It sort of feels that you’re doing any distinctive trick. Moreover, The contents are masterwork. you’ve done a magnificent process in this matter! Just wish to say your article is as amazing. The clarity in your post is simply cool and i can assume you are an expert on this subject. Fine with your permission allow me to grab your RSS feed to keep up to date with forthcoming post. Thanks a million and please carry on the enjoyable work. Whats Going down i am new to this, I stumbled upon this I have found It positively helpful and it has aided me out loads. I am hoping to give a contribution & help different customers like its helped me. Good job. I’m writing to make you be aware of of the wonderful experience our child encountered browsing your webblog. She noticed plenty of details, which include how it is like to have a marvelous teaching style to let certain people smoothly grasp specific specialized subject matter. You truly exceeded her expectations. Thank you for distributing those practical, healthy, informative and even unique thoughts on the topic to Sandra. I¡¦ll immediately take hold of your rss as I can’t to find your email subscription link or newsletter service. Do you’ve any? Kindly allow me recognise so that I could subscribe. Thanks. You really make it seem really easy together with your presentation but I to find this matter to be actually something that I think I’d never understand. It kind of feels too complicated and very large for me. I’m looking forward on your next submit, I¡¦ll attempt to get the dangle of it! Hiya, I’m really glad I have found this information. Nowadays bloggers publish only about gossips and web and this is actually irritating. A good website with exciting content, that’s what I need. Thanks for keeping this web site, I will be visiting it. Do you do newsletters? Cant find it. My husband and i were really thankful Peter managed to carry out his preliminary research out of the ideas he had from your own blog. It is now and again perplexing to simply choose to be handing out techniques which many others have been trying to sell. We really understand we now have the website owner to appreciate for that. The explanations you’ve made, the easy web site navigation, the friendships you will aid to promote – it’s many unbelievable, and it’s really facilitating our son in addition to the family reason why that concept is satisfying, which is certainly seriously important. Thank you for the whole lot! Huffman Tx! Just wanted to say keep up the good work! What’s up, I read your blogs like every week. Your story-telling style is awesome, keep up the good work! I want to point out my respect for your kind-heartedness supporting those people that really want help on this one issue. Your very own dedication to getting the message around appeared to be astonishingly insightful and have constantly encouraged regular people much like me to arrive at their aims. The invaluable help signifies much to me and a whole lot more to my peers. Warm regards; from each one of us. Great remarkable issues here. I¡¦m very glad to peer your post. Thanks a lot and i am taking a look ahead to contact you. Will you kindly drop me a e-mail? Hi there very cool web site!! Man .. Excellent .. Amazing .. I will bookmark your website and take the feeds also¡KI am glad to find so many helpful information right here in the submit, we’d like develop more strategies in this regard, thanks for sharing. . . . . .
to be great. I do not recognise who you might be however certainly you are going to a famous blogger in the event you are not already. Wonderful goods from you, man. I have understand your stuff previous to and you are just extremely excellent. I really like what you’ve acquired here, certainly like what you’re saying and the way in which you say it. You make it enjoyable and you still care for to keep it wise. I can not wait to read much more from you. This is actually a terrific website. Great goods from you, man. I have understand your stuff previous to and you are just too wonderful. I really like what you have acquired here, really like what you are saying and the way in which you say it. You make it enjoyable and you still care for to keep it sensible. I can’t wait to read far more from you. This is really a tremendous site.